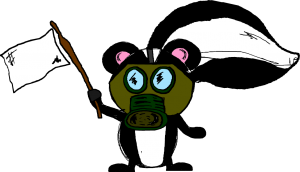 stinkinthinkinstinks | I Don't Stink! Sometimes we think “Kids are young. They won’t remember. They’ll bounce back from any adversity.” But today they’re faced with issues we never imagined when we were growing up. Times have changed, and much has not been for the better. Think about how you felt growing up. We did not hear about kidnappings, school shootings and the like. Sure, all kids can have it tough at times, but in a post 9/11 society many things have been lost or forgotten and one of them is our youth’s Self Esteem. Those statistics are too powerful to ignore. They will have lasting consequences on future generations unless we do something about all this negativity NOW. The underlying issue is that most of our kids are not even aware of the effects of negative thoughts on their self-esteem and thus do nothing about it. Without the essential tool of awareness they are destined to relive old belief patterns and repeat the same negative behaviors over and over again. 90% get along better with other kids. 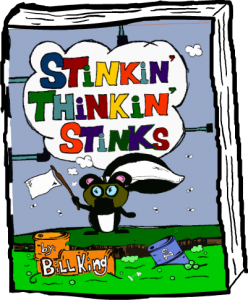 STINKIN’ THINKIN’ STINKS is a revolutionary book that provides kids the proven steps necessary to deal with everything our youth are faced with today. 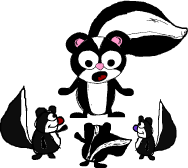 STINKIN’ THINKIN’ STINKS offers a fun new accessible approach to exterminating negativity while inviting YOU to change YOUR LIFE for the better! 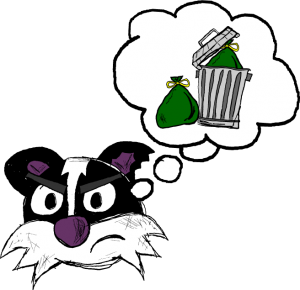 Click here to purchase now or feel free to read on about why STINKIN’ THINKIN’ STINKS is just the tool we need today to have a positive impact in the world. We all now know how important it is to stop bullying and violence in schools, on the playground, and at home. This topic has been in national headlines over the last few years and now there is a book that offers a solution to help stop bullying before it even starts! This book is for the kids, however we need parents and educators to be the leaders in turning this situation around. Want to change a kid’s life for the better? Want to be a part of the SOLUTION? Buy STINKIN’ THINKIN’ STINKS and share it with the important younger people in your life. In STINKIN’ THINKIN’ STINKS young readers receive proven techniques to recognize, deal with, and lessen the negativity that holds many of them back. Readers will: Become aware of negative thought patterns Discover ways to eliminate negative thinking Learn how to avoid negative pack mentality Access the positive in life, school and at home Develop techniques for dealing with negative people and situations Embrace positivity as the dominant way of thinking Full of fun exercises and activities, designed to provide kids with real tools for changing negative habits and increasing self-esteem, STINKIN’ THINKIN’ STINKS offers a fun new accessible approach to exterminating negativity while inviting YOU to change YOUR LIFE for the better! 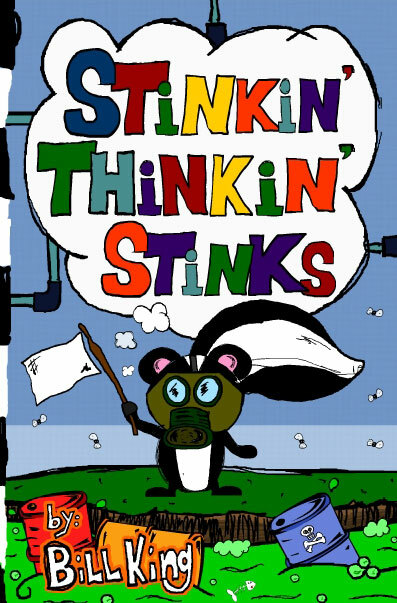 STINKIN’ THINKIN’ STINKS will inspire discussion, introspection, and positive change in all ages of readers. Don’t take our word for it. Check out these SaWEET Reviews! “As a parent, grandparent, former teacher and counselor, I feel children are subjected to more negative situations in today’s world than ever before. The skills children will learn from Bill’s book are much needed tools and can help avoid or diffuse otherwise building powder kegs of negativity in our nation’s children.” Tami Hendrix, M.A., LPC of Arlington Counseling Group. “This book is exactly what we need more of in our students’ early stage learning curriculum. It’s not just about studies and testing in school; these kids need to learn how to manage their lives in social situations in and out of school so they can reach their potential and be focused on their school work in a positive and meaningful way. Fantastic book!” – T.L. Special Education Teacher, PTA Vice President. Bill King is a writer, speaker, and mentor. A master of designing and implementing processes to simplify complex issues with amazing results, he used this gift to design fun, exciting and educational ideas to help kids deal with negativity, low self-esteem, bullying and anger. He teaches kids positive thinking, kindness, forgiveness and awareness in a way they can relate to. In addition, Bill is a certified DDI, Inc. (Developmental Dimensions International) trainer and has conducted hundreds of training classes, seminars, and workshops. His life’s mission is to provide service to others to help them define and achieve their goals. 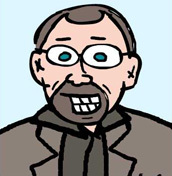 Bill has written several books, notably 7 Days to Inner Peace: The Building Blocks of Awareness, and the adolescent’s version called The Building Blocks of Creation: An Adolescent’s Guide to Awareness. Not ready to purchase just yet? No worries, but don’t miss out on staying in touch with us! 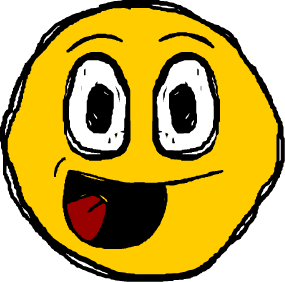 Be sure to include your contact info here for your free gifts and access to our newsletter. CLICK HERE to go and preview all of the AWESOME free gifts that you'll receive after you go and buy your copy of "STINKIN' THINKIN' STINKS" and finish registering for the site. After you go and get your copy, click here to register and then have access to tons of AWESOME bonus gifts!